IRNA – Four ambassadors and representatives from six other states visited Tabatabaei House in old historical neighborhood of Kashan city on Wednesday. Head of the UN High Commissioner for Refugees in Tehran Sivanka Dana Pala, ambassadors of Australia, Sweden, Afghanistan and the Netherlands as well as representatives from Germany, Spain, Switzerland, Norway, Japan and France visited the historical site. Deputy Governor General of Isfahan province and governor of Kashan Hamid Reza Mo’menian described Kashan as an old city with seven thousand years civilization. He expressed hope that the post-JCPOA era would help more cultural interaction between Iran and other countries. Mo’menian said that Iran is hosting refugees from other countries for many years, because of our religious thoughts and beliefs. As per the command of the Supreme Leader, the refugees in Iran were provided with education service and now all refugees are enjoying education as well as insurance services just like Iranian citizens, Mo’menian added. He expressed hope that the visit of foreign envoys to Kashan would serve to support the refugees by all necessary legal means. 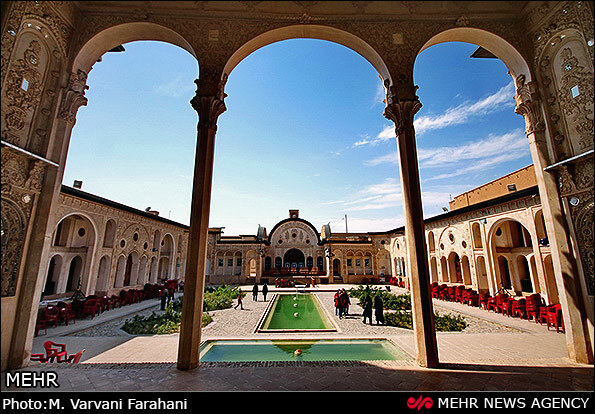 Tabatabaei House is a masterpiece of art of architecture dating back to around 200 years ago the era of Qajar Dynasty. The building with fabulous decoration and gorgeous architecture is one of the most beautiful and interesting historical buildings in Kashan registered as national cultural heritage.